A glaciologist has discovered a possible 2nd impact crater buried under more than a mile of ice in northwest Greenland. Scientists think that a newly-discovered bowl-shaped feature buried under more than a mile of ice in northwest Greenland might be another impact crater. 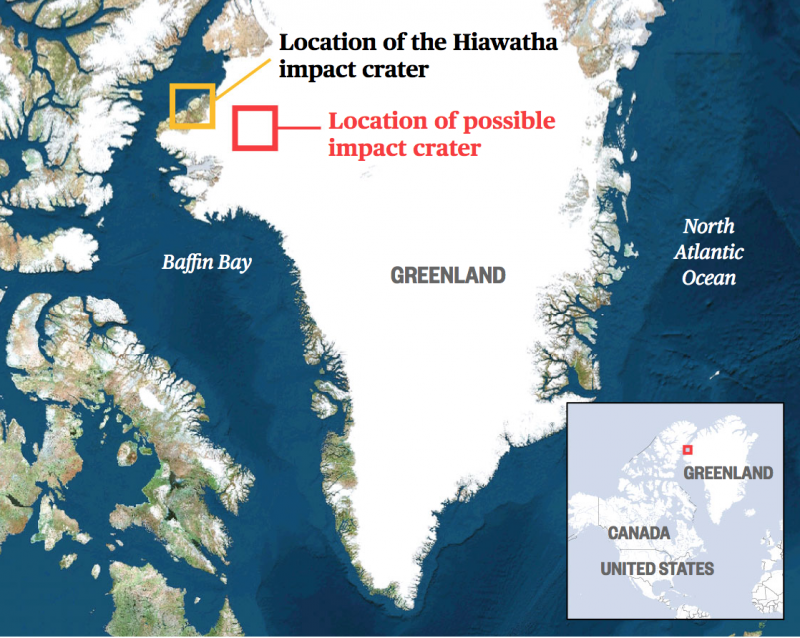 This follows the finding, announced in November 2018, of a 19-mile (30.5-km) wide crater beneath Hiawatha Glacier – the first meteorite impact crater ever discovered under Earth’s ice sheets. Though the newly found impact sites in northwest Greenland are only 114 miles (183.4 km) apart, at present they do not appear to have formed at the same time. If the second crater, which has a width of over 22 miles (35.4 km), is ultimately confirmed as the result of a meteorite impact, it will be the 22nd largest impact crater found on Earth. Once we knew from Hiawatha that there could be craters under ice sheets, it was quite easy to find the next one using an ensemble of publicly available NASA data. Image via NASA/Robin Muccari/NBC News. I began asking myself ‘Is this another impact crater? Do the underlying data support that idea?’ Helping identify one large impact crater beneath the ice was already very exciting, but now it looked like there could be two of them. The only other circular structure that might approach this size would be a collapsed volcanic caldera. But the areas of known volcanic activity in Greenland are several hundred miles away. On the whole, the evidence we’ve assembled indicates that this new structure is very likely an impact crater, but presently it looks unlikely to be a twin with Hiawatha. Bottom line: A glaciologist has discovered a possible 2nd impact crater buried under more than a mile of ice in northwest Greenland.